New at Autogeek, Optimum 8 inch 100% Twisted Wool and 8 inch Foam Finishing Pads, Double-Sided Rotary Adapter, and Opti-Flex 7 inch Backing Plate round out a complete polishing system with Optimum Hyper Compound Spray and Optimum Hyper Polish Spray. To get the best performance out of the revolutionary new Optimum Hyper sprays, Optimum? has released 100% Twisted Wool 8 Inch Pads and Foam Finishing 8 Inch Pads. They’re both available in single or double-sided pads. The necessary Double-Sided Rotary Adapter and Opti-Flex 7 Inch Rotary Backing Plate are also available. The system is designed for rotary polisher use. Armed with the Optimum Polishing System, you can eliminate all types of imperfections on your vehicle and create an incredible shine. These are professional grade formulas applied with professional grade tools. The polishes were designed specifically for OEM application, so you know they can tackle any paint flaw. First use Optimum Hyper Compound Spray with a Optimum 100% Twisted Wool Pad. Choose the single or double-sided pad, depending on your preference. This step will remove deep scratches and heavy swirls, but it leaves very little haze. Optimum Hyper Compound Spray finishes more like a polish than a compound, which means you can achieve the results you want in less time. Next, use Optimum Hyper Polish Spray with an Optimum Foam Finishing 8 Inch Pad. Keep in mind that Hyper Polish Spray isn’t necessarily a finishing polish. It can remove heavier imperfections if used with a polishing foam pad. But, assuming you’ve just used Optimum Hyper Compound Spray, Optimum Hyper Polish Spray works very well as a finishing polish to restore a deep gloss to the paint. 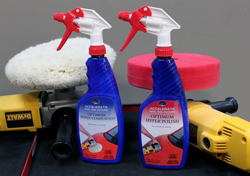 With the introduction of the 100% Twisted Wool Pads and Foam Finishing Pads, Optimum has created a complete polishing system. Plus, you have the flexibility to choose single or double-sided pads. View the video below to see the Optimum Hyper Polishing System in action. Find all the products mentioned here at Autogeek.net.